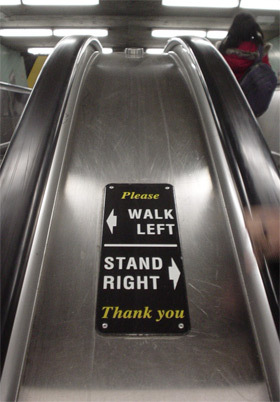 Say Goodnight to "Walk Left, Stand Right"
Citing safety concerns, the TTC is removing their “Walk Left, Stand Right” escalator signs system-wide. After we got sent a tip by reader Tom Mertron of Toronto Rants, a quick trip on the system this afternoon showed that only one of the four downtown stations that we checked — St. Patrick — still has the signs in place beside the escalators. At the others — Museum, Dundas, and Queen — they’ve been removed, and all that’s left behind are the screw holes where the signs used to be. At some other stations that Mertron went to when he started noticing the missing signs, ugly streaks, stains, and scrapings also mark the signs’ former homes. According to TTC customer service, the signs were removed because they are trying to “discourage people from walking on the escalators because there have been so many accidents that have taken place.” Really? If memory serves us, the only big event in recent memory was that escalator pile-up in November that injured eight people. A horrifying and shocking incident, to be sure, but the very definition of a freak accident. To put it bluntly, eight people injured out of 430,000,000 trips taken on the TTC in a year isn’t a significant enough problem when, say, far more people die each year by throwing themselves in front of trains. But it’s the logic of this move on the TTC’s part that’s so confusing. The signs — so associated with the TTC that they appear in many travel guides as a cute quirk of our transit system, and that we featured the design in our t-shirt suggestions — are there for etiquette, not to remind people that they have movable legs. Removing the signs won’t discourage walking on escalators, because they never encouraged it in the first place. Instead, the signs, simple and crude as they were, promoted order and kindness over chaos and confusion. Getting rid of them is not, by any stretch of the imagination, going to stop people from walking up escalators. All it will do is make etiquette for that one little bit of the subway-going journey worse.